In this article I will share my thoughts on the Carbonice Stummer Eugen chain catcher and compare it with the Canyon chain catcher that I’ve used over the past couple of years. Both chain catchers differ significantly in used material, assembly on your road bike and for the weightweenies among us the chain catcher weight. The Stummer Eugen chaincatcher hasan exceptional light weight of 3.2 grams including the aluminium clamp-bolt for your front derailleur. The chain catcher is a single piece of carbon in a traditional chain catcher shape. Remark most of the professional road cyclists use a chain catcher on their pro bikes through out the year. On the chain catcher you will see the white branding, which feels lick a sticker that has been put on the carbon Stummer Eugen. So first thing I did was removing it, so I have a simple black carbon finish. Second I changed the black aluminium bolt with a titanium version, to feel more safe when putting the bolt on the required 5 – 7 Nm. Tightening aluminium bolts can sometimes be a little tricky, even with an excellent torque wrench. The Carbonice Stummer Eugen is easy to install, and integrates perfectly with the Dura Ace 9000 front derailleur. I have been using the Canyon chain catcher as well, which is crafted from a piece of aluminium. 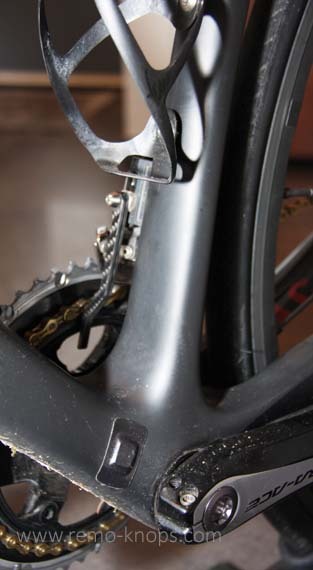 The Canyon chain catcher is installed behind the (vertical) bottle cage on your seat tube. So the installation method and -location differs from the Carbonice Stummer Eugen, just like the material of the chain catcher. It is a idiot-proof chain catcher as well, which only has the disadvantage that the bottle cage on the seat tube is installed on top of the Canyon chain catcher. However this is more an aesthetic point, and certainly not a functional or practical issue. When I purchased my Canyon Ultimate CF SLX, I purchased the Canyon chain catcher directly with the bike so the discounted price would be € 14,95 instead of the normal price of € 19,95. Please remark that the Canyon chain catcher has been tested by Movistar and Katusha in the worlds toughest cobble stone races like Paris Roubaix and the Rond van Vlaanderen. The Carbonice Stummer Eugen is a super lightweight chain catcher from an established German “quality” company. 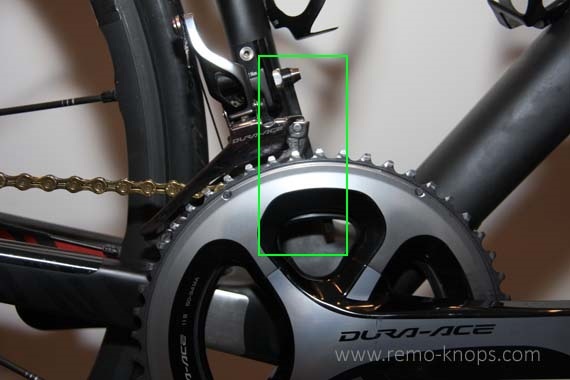 The weight and astheatics on the bike were the drivers to purchase the Carbonice chain catcher in the Starbike webshop for the price-point of € 19,95 (as a member from the weightweenie forum you get additional 5% reduction). You can’t go wrong with either of the chain catchers, and only personally would only prefer a titanium bolt over the Carbonice aluminium bolt. Also check out the super lightweight spoke magnet from Carbonice (size is about the head of a matchstick) with the cool product name Starker Heinrich. Hey!, I found this information for you: "Carbonice Stummer Eugen chaincatcher". Here is the website link: https://www.remo-knops.com/5785/carbonice-stummer-eugen-chaincatcher/. Thank you.